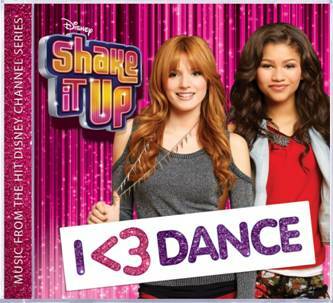 The all-new Shake It Up: I <3 Dance soundtrack, from Walt Disney Records is now available. With songs featuring Disney Stars Bella (Shake it Up), Zendaya (Shake it Up), Selena Gomez (Wizards of Waverly Place), Bridgit Mendler (Good Luck Charlie), Roshon Fegan (Shake it Up) , Caroline Sunshine (Shake it Up), Coco Jones ( Let It Shine), and McClain Sisters (musicians). This is the must have CD for your Disney fan. Disclosure: This post is sponsored by Child’s Play Communications and Disney. Product was received in exchange for this post. The 12 dance tracks featured in the CD are featured on the third season of the hit show Shake it Up. Zendaya is also currently on “Dancing with the Stars” as one of the youngest contestant to grace the dance floor. Visit Disney.com/music for more information. Connect with Disney Music Facebook and Twitter.